Runners must know their bib number (e-mailed to you by Monday, October 15 by 4pm.) We prefer you print out the email prior to your arrival. If you do not receive this email by Monday, Oct. 15 by 4pm DO NOT PANIC! Simply email [email protected] and we will provide some trouble shooting tips. The fair yet challenging course travels through the many diverse neighborhoods including the scenic Inner Harbor waterfront area, historic Federal Hill and charming Fells Point. The route also travels through the Maryland Zoo in Baltimore right past the penguin exhibit who will undoubtedly be dressed in their tuxedos awaiting your arrival. Miles 16-20 of the marathon route have been compared to Boston’s famed “Heartbreak Hill” but runners are rewarded with a loop around Lake Montebello which provides some relief and flat terrain. The final 5 miles are mostly downhill and boast some of our most friendly spectators who have been known to hand out gummy bears and open their homes for bathroom emergencies. Then it’s a left turn onto Pratt Street to a finish in the shadow of the USS Constellation and a celebration of your run along the waterfront promenade through McKeldin Square, West Shore Park and Rash Field. 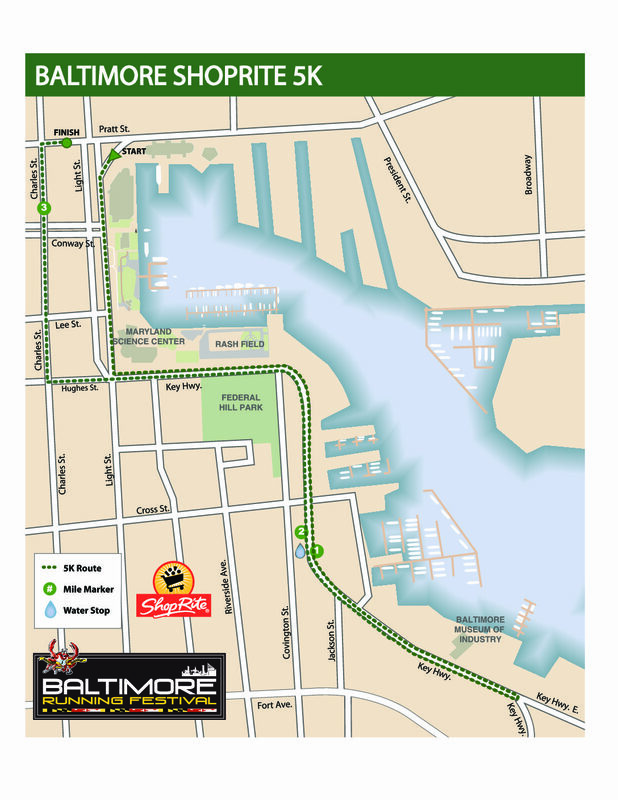 The half-marathon start line is a party on the shores of Baltimore’s famed Inner Harbor, the 13-mile mark of the marathon. Complete with a live band and 11,000 of your new best friends, this unique set up allows for the fastest marathoners and those attempting to qualify for Boston to pass and assures that the marathon champion will be the first to cross the finish line for the LIVE television coverage on WBAL-TV. 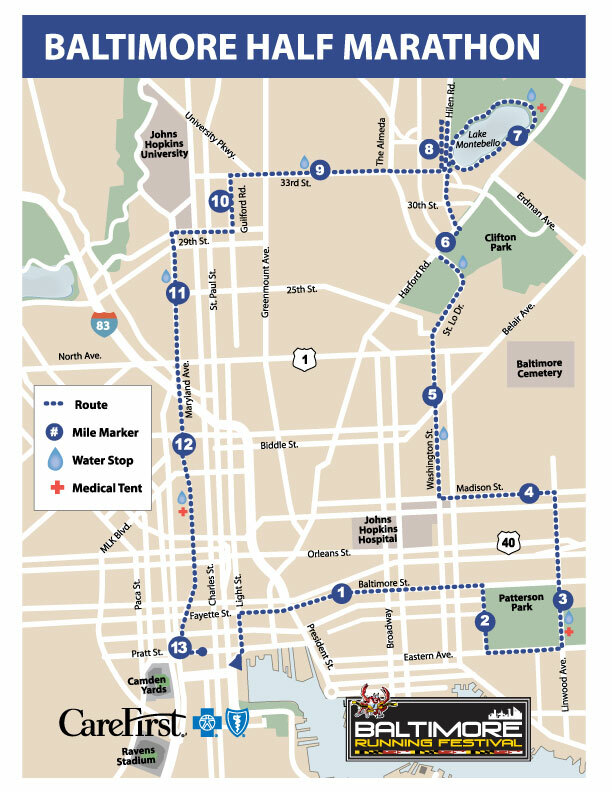 The half-marathon will split from the marathon at Pratt Street and merge later in the race with marathon. 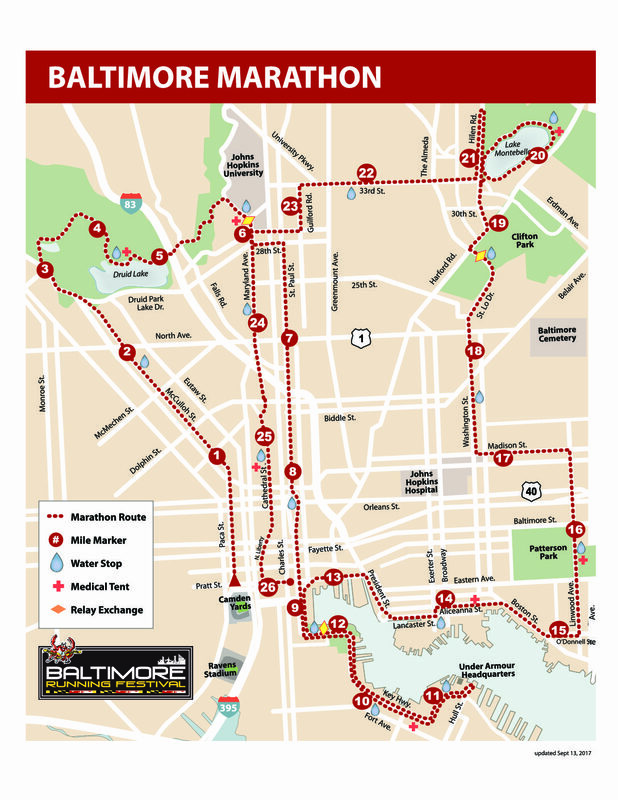 From that point, marathoners and half-marathon participants will run the same course to the finish line in Baltimore’s famed and iconic Inner Harbor! The ShopRite 5K race has grown into the second largest distance in terms of participation. Many RunFest participants start with the 5L one year and increase their race distance the following year. In 2019, the 5K will once again start at Light and Pratt Streets in Baltimore’s iconic Inner Harbor. The flat 5K course will show off the scenic view of Charm City’s most famous landmark. 5K finishers also enjoy the same amazing home stretch along Pratt Street and finishes at the same finish line as the other race distances near McKeldin Square, giving all participants a similar thrilling experience when completing their race. Yes there will be a bag check at the race. Runners are required to place belongings in the clear bags given out at the expo. No oversized bags or luggage will be accepted. All bags are subject to search. Please arrive extra early if you plan on checking a bag due to increased security. Bag check will be open from 6:30a-1:30p. After this time, unclaimed bags will be relocated to the information tent. 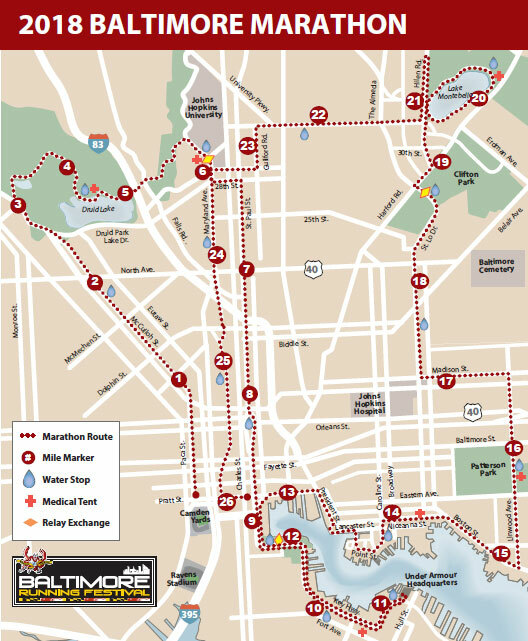 Marathon & Relay Runners: bag check buses will be available near the stadium lots, after the start of the marathon and relay the buses will relocate to the Inner Harbor behind West Shore Park and the Visitors Center for bag retrieval. We will be providing a free courtesy shuttle to the expo from lots F and G. It is about a 15-minute bus ride each way. The shuttle stop will be located on the curbside island between lots G & H (see the adjacent map and look for the shuttle bus flag) from 11:30am-8:30pm each day of the expo. Spectators are welcome and encouraged! We need your help to support your community and local charities as well as thousands of Baltimore Running Festival participants by registering as an Expo or Race Crew volunteer. Individuals like you, your family, friends and colleagues are key to the success of the Baltimore Running Festival. More than 1,500 Expo and Race Crew volunteers are needed to make the Baltimore Running Festival successful. Volunteer opportunities are available at the pre-race Nava Health and Vitality Expo and on race day. All crew member volunteers will receive an Under Amour volunteer t-shirt. Head over to the Baltimore Running Festival website to volunteer! The full marathon will have pacers, while the half marathon will not. For more information on the organization providing pacers. The use of personal music devices is permitted. However, To enjoy all that our event has to offer and for the safety of all participants, the Baltimore Running Festival encourages a headphone-free environment during the running of all its race distances. At every water stop there will be at least 2 porta-john’s. How was Baltimore Running Festival?